The solution SP#508 is correct. Neat work, Monox D. I-Fly! 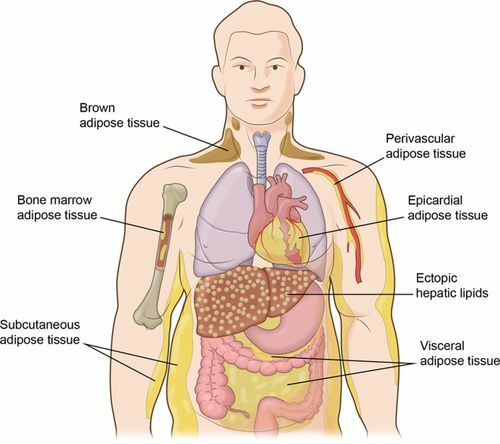 Adipose tissue, or fatty tissue, connective tissue consisting mainly of fat cells (adipose cells, or adipocytes), specialized to synthesize and contain large globules of fat, within a structural network of fibres. It is found mainly under the skin but also in deposits between the muscles, in the intestines and in their membrane folds, around the heart, and elsewhere. It is also found in the bone marrow, where it imparts a yellow colour; yellow marrow is most abundant in adults. The fat stored in adipose tissue comes from dietary fats or is produced in the body. Mammals have two different types of adipose: white adipose tissue and brown adipose tissue. White adipose, the most common type, provides insulation, serves as an energy store for times of starvation or great exertion, and forms pads between organs. When muscles and other tissues need energy, certain hormones bind to adipose cells and trigger the hydrolysis of triacylglycerol, resulting in the release of energy-rich fatty acids and glycerol—a process known as lipolysis. The enzyme responsible for hydrolysis is lipase, which occurs in the blood, certain gastrointestinal juices, and adipose tissue. Lipase is activated by the hormones epinephrine, norepinephrine, glucagon, and adrenocorticotropin, which bind to adipocytes. White adipose tissue also is a source of a number of different hormones, which serve various roles in metabolism and endocrine function. The adipose-produced hormones adiponectin, leptin, and resistin are involved in energy metabolism, for example, whereas plasminogen activator inhibitor-1 prevents the dissolution of blood clots. In humans, the distribution of adipose tissue in the body can vary depending on gender. In general, men accumulate fat around the waist, and women tend to accumulate more fat around the hips than the waist. Geneticists have located distinct regions in the human genome that are associated with fat distribution, and several genes in particular appear to have a greater influence on waist-to-hip ratio in women than in men. Because these genes are involved in regulating the activities of fat cells, knowledge of their precise functions could provide insights into the biological mechanisms underlying obesity, diabetes mellitus, and cardiovascular disease. M # 511. If the radius of a circle is 6 centimeters and the length of an arc is 12 centimeters, find the area of the sector. #4451. 75% of a number is equal to three seventh of another number. What is the ratio of the first number and the second number? The solution #7392 is correct. Excellent, Monox D. I-Fly! #7393. The sum of 15% of a positive number and 10% of the same number is 70. What is twice that number? Q: What did baby corn say to mama corn? Q: What do you call your dad when he falls through the ice? Q: How do you know your dad is planning for the future? Q: Why did the baby strawberry cry? A: Because his dad was in a jam! Q: What did the daddy tomato say to the baby tomato? Q: Why are Fathers like parking spaces? A: The good ones are already taken! Q: Why did the cookie cry? A: Because his father was a wafer so long! Q: What did daddy spider say to baby spider? A: You spend too much time on the web. Q: What do you call the father you walk all over? Q: What is fathers day? A: The day in June when a father remembers he hasn't yet paid the bills for Mother's Day. #7211. Name the French writer (24 July 1802 – 5 December 1870). His works have been translated into many languages, and he is one of the most widely read French authors. Many of his historical novels of high adventure were originally published as serials, including 'The Count of Monte Cristo', 'The Three Musketeers', 'Twenty Years After', and 'The Vicomte of Bragelonne: Ten Years Later'. His novels have been adapted since the early twentieth century for nearly 200 films. #7212. In Norse mythology, it is a burning rainbow bridge that reaches between Midgard (Earth) and Asgard, the realm of the gods. What is it? #3199. What does the verb (used with object) derogate mean? #3200. What does the noun derrick mean? The solution #7391 is correct. Neat work, Monox D. I-Fly! #7392. The difference between 89% of a number and 73% of the same number is 448. What is 49% of that number? Very good attempt, Monox D. I-Fly! #4450. The ratio of the present ages of Smith and Tony is 4 : 5. Six years hence, the ratio of their ages will be 6 : 7. What is the difference of their ages? Martin(us) van Marum (20 March 1750, Delft – 26 December 1837, Haarlem) was a Dutch physician, inventor, scientist and teacher, who studied medicine and philosophy in Groningen. Van Marum introduced modern chemistry in the Netherlands after the theories of Lavoisier, and several scientific applications for general use. He became famous for his demonstrations with instruments, most notable the ‘Large electricity machine’, to show statical electricity and chemical experiments while curator for the Teylers Museum. Born in Delft, Van Marum moved to Haarlem in 1776 ‘because the Haarlemmers had more taste in the sciences than anywhere else in the Netherlands’. After his arrival in Haarlem he began to practise medicine, but devoted himself mainly to lecturing on physical subjects and creating instruments to demonstrate physical theory. He must have made a big impression on Haarlem society, because he became a member of the Dutch Society of Science in the same year, but was named director and curator of their cabinet of curiosities in the next year. Van Marum received at first no salary, but by scaring off the former cabinet concierge Nicolaus Linder, he was able to collect Linder's' salary of 100 guilders, and when the cabinet moved later in 1777 to new quarters in the Grote Houtstraat 51, van Marum lived there as concierge. He managed to scare off Linder by obtaining permission from the society to allow his servants to keep tips they received from cabinet visitors; a source of income that Linder had come to rely on. Then van Marum increased this salary to 300 from 100 by adding responsibilities to his list of duties, such as a summer garden in the Rozenprieel and eliminating other expenses. In 1779 he was entrusted with the care of the ‘Second society’ left to Haarlem by Pieter Teyler van der Hulst (1702–1778), which led under his direction to the foundation of the Teylers Museum. The Teyler legacy was split into three societies, one for religion, one for science, and one for the arts, known as the first, second, and third societies. The caretakers had to meet in Teyler's home weekly, and each society had 5 caretakers, so all of the gentlemen involved lived in Haarlem. In 1794 van Marum became secretary as well as director of the Dutch Society of Science. Under his management, both societies were advanced to the position of the most noted in Europe. Period travelogues mention both Museums. Besides being involved with the ‘Hollandsche Maatschappij der Wetenschappen’, he was an ordinary member (5 December 1776) and a corresponding member (from 25 December 1776) of the 'Provinciaal Utrechtsch Genootschap van Kunsten en Wetenschappen', a member of the 'Bataafsch Genootschap der Proefondervindelijke wijsbegeerte' from 1784, a member of the 'Zeeuwsch Genootschap der Wetenschappenfrom' 27 August 1782, corresponding member of the 'Académie des Sciences' from 1783, and a member of the ‘Vergadering van Notabelen voor het departement Zuiderzee’ from 29 March 1814. In 1808 he was asked by Louis Bonaparte to be a member of the committee for the formation of the Koninklijk Instituut along with Jeronimo de Bosch, Jean Henri van Swinden, and Martinus Stuart. He became member of the institute the same year. Under his guidance the two societies slowly merged. His name is associated with the ‘Electriseermachine’, the largest electricity demonstration machine with Leiden jars built in the 18th century and at the time a crowd pleaser for the young Teylers museum. The demonstration model is still on display, as is a smaller version in the Museum Boerhaave of Leiden. Van Marum's researches (especially in connection with electricity) were remarkable for their number and variety. The Teyler's Museum kept its role as a museum of scientific research (some of the periodical subscriptions he started are still running) and is a repository of important scientific demonstration models from the period. Not only items regarding electricity, but also weather stations, industrial models, steam engines, and other examples of the budding industrial revolution were collected and lovingly displayed. The collection of the Teyler's was mostly based on scientific theory, while the collection of the Dutch Society of Science was mostly based on scientific practise. The rooms in the Grote Houtstraat were filled with stuffed animals and other "naturalia", while the summer garden was a modern continuation of Linder's old Linnaeus hortus once located behind the original city hall quarters in the Prinsenhof. Since Linder had not known any Latin, it was easier for Van Marum to entertain foreign visitors with stories of Linnaean trivia and of course, the Haarlem story of tulip mania. In 1784, when the Teylers Museum opened its new 'Oval Room', the artist Vincent Jansz van der Vinne was hired as curator of the art collection and lived in Pieter Teyler's former residence that was called the "Fundatiehuis" as concierge and caretaker of the art collection. He left the next year because of continuous disagreements with van Marum over art and the opening hours of the museum. Van der Vinne was an artist born into an important Haarlem artist family – he was the great-grandson of Vincent van der Vinne. The Teyler's museum replaced him with another local artist, Wybrand Hendricks, who painted the famous oval room and many other Haarlem scenes. Hendricks is largely responsible for the Teyler's collection of Old Master prints, most notably the purchase in Rome 1790 of a print & drawing collection formerly owned by Christina of Sweden. Apparently he got along under van Marum, but when he left in 1819 at the age of 75, the Teyler's decided to discontinue the purchase of art "for the decline in art enthusiasts in this city". During the tenure of Hendriks, van Marum himself was busy giving public demonstrations of electricity in the Oval room, but was also collecting in this period (this is why he was so involved with the lifestyle of the concierge of the Fundatiehuis, since he was there every day). He concentrated on scientific publications for the Teyler library. He concentrated his efforts on three aspects: 1) Greek and Latin authors, among them the church fathers, 2) Works of natural history including travelogues, and 3) natural history periodicals, including all publications of the Royal Society of London and all publications of the Dutch Society of Science, which Teyler had been a member of, but could not be on the board of, due to religious differences with the board. The criteria for purchase was always expense. If a Society member could afford to purchase it himself it was not worth adding to the collection. Any member could suggest purchases, however, which explains why the collection is filled with richly illustrated examples of contemporary publications. The most impressive of these are the large illustrated books of travellers. To view the collection, van Marum organised ‘gentleman evenings’ in Pieter Teyler's library, a tradition that still exists. Though the public is allowed access during the day to the museum rooms, the private rooms of Pieter Teyler in the "Fundatiehuis" are only open one day a year, on Monument Day. Because of its rich scientific tradition, many noted scholars of Physics moved to Haarlem to work at Teyler's, including Nobel prize winners Pieter Zeeman and Hendrik Lorentz. Of van Marum's three categories, only the first was discontinued at the close of the 19th century. The collection of periodicals which has been expanded through exchange networks, contains uninterrupted series that are among the oldest in the world. The Teyler's museum created a new wing in 1996 to house a rotational display of van Marum's library collection, such as the works of John James Audubon in combination with contemporary stuffed birds of Naturalis. The solution #7390 is correct. Excellent, Monox D. I-Fly! #4449. The largest and the second largest angles of a triangle are in the ratio 13 : 12. The smallest angle is 20% of the sum of the largest and the second largest angles. What is the sum of the smallest and the second largest angles? SP#507. The fourth and eighth terms an an Arithmetic Progression are in the ratio 1 : 2 and tenth term is 30. Find the common difference. The solution #7389 is correct. Neat work, Monox D. I-Fly! #7390. 56% of a number is 1064. What is 38% of that number? The solution #4447 is correct. Excellent, Monox D. I-Fly! #4448. The total number of boys in a school are 16% more than the total number of girls in the school. What is the ratio of the total number of boys and total number of girls in the school? M # 510. What is the diameter of a circle whose area is equal to the areas of two circles of radii 40 centimeters and 9 centimeters? The solution SP#505 is correct. Excellent, Monox D. I-Fly! SP#506. Find the sum of all natural numbers between 200 and 300 which are divisible by 6. (200 and 300 are excluded). #3197. What does the adjective derivative mean? #3198. What does the noun dermatitis (Pathology) mean? Otter, (subfamily Lutrinae), any of 13 or 14 species of semiaquatic mammals that belong to the weasel family (Mustelidae) and are noted for their playful behaviour. The otter has a lithe and slender body with short legs, a strong neck, and a long flattened tail that helps propel the animal gracefully through water. Swimming ability is further enhancedin most species by four webbed feet. Two species are marine, with the others living predominantly in fresh water. Otters range in size from 3 kg (6.6 pounds) in the Asian small-clawed otter (Aonyx cinereus, formerly Amblonyx cinereus) to 26 kg (57 pounds) in the giant otter (Pteronura brasiliensis) and 45 kg (99 pounds) in the sea otter (Enhydra lutris). Furcolour is various shades of brown with lighter underparts. The 11 species often referred to as river otters are found throughout North America, South America, Europe, Africa, and Asia in freshwater ecosystems that sustain an abundance of prey such as fish, crayfish, crabs, mussels, and frogs. Most river otters are opportunistic, feeding on whatever is most easily obtained. Diet often varies seasonally or locally, depending on which prey is available. River otters hunt visually while chasing fish, but they use their manual dexterity to dislodge crabs and crayfish from under rocks. Sensory hairs on the snout called vibrissae also assist by sensing water turbulence. After being captured in the teeth or forefeet, prey is consumed either in the water or on shore. River otters hunt more effectively in shallow water than in deep water, and, although they are proficient swimmers, all prefer slow-swimming species of fish. African clawless otters (Aonyx capensis) and Congo clawless otters (A. congicus or A. capensis congicus) occupy murky waterways and thus rely more on manual dexterity than on vision to obtain food (mostly crabs) from under rocks. Their front feet are hand like and partially webbed. Most travel is aquatic, but river otters can venture swiftly overland between bodies of water. They typically follow the shortest route possible and often establish much-used trails. While in the water, they constantly search features such as logjams and deepwater pools for prey. To rest, otters seek refuge in underground holes, rock crevices, beaver lodges, cavities in root systems, or simply dense vegetation along the shoreline. When not resting or eating, river otters can often be seen eagerly sliding down mud or snow banks. Many species establish regular latrine sites along the shores of lakes or rivers. Such stations may facilitate communication between individuals. Litter size ranges from one to five. Young otters (pups) may fall prey to large raptors, and various carnivores may kill adults traveling on land. In warmer regions crocodiles and alligators are threats. However, most mortality results from human activities, in the form of road kills, drownings in fishnets, destruction as pests around fishing areas, or trapping for their fur. Two otter species are strictly marine: the sea otter (Enhydra lutris) of the Pacific Coast of North America and the much smaller marine otter (Lontra felina) from the coast of Peru and Chile. Both rely exclusively on marine prey, although the sea otter can be found much farther offshore; the marine otter stays within about 100 metres (330 feet) of the shore. Sea otters are well adapted to marine life. The front and back feet are fully webbed; large lungs allow long dives and provide buoyancy and thick fur provides insulation. Sea otters can also drink salt water and thus can remain at sea for several days at a time. Sea otters are usually solitary but are sometimes seen in groups—gatherings of up to 2,000 have been observed along the coast of Alaska. At night, sea otters may choose either to sleep on land or simply to rest afloat near beds of kelp. They feed mainly on sea urchins, crabs, and various shellfish. Fish are also eaten. Captured prey is eaten at sea while the otter swims on its back. Rocks are typically used to break open crabs and shellfish, whereas sea urchins are crushed with the forefeet and teeth. Sea otter predation on the herbivorous urchins (genus Strongylocentrotus) enables kelp forests and the fish associated with them to flourish. However, large numbers of sea otters can deplete shellfish populations, conflicting with fisheries for crabs, clams, and abalones. Females give birth in water to only one young, which remains dependent on the mother until six to eight months of age. Sharks and killer whales eat sea otters on occasion. The marine otter is really a freshwater otter that has learned to occupy marine environments in South America. This small (3–6 kg [6.6–13.2 pounds]) otter occurs on the Pacific coast from Peru through Chile and Tierra del Fuego in Argentina. It is mostly solitary, and only rarely do groups of more than three animals occur. Marine otters occupy the intertidal zone that covers the first 100–150 metres (roughly 330–500 feet) of coastal water and about 30 metres (100 feet) inland. They feed on crustaceans such as crabs and shrimp, as well as mollusks and fish. Interestingly, marine otters do not consume sea urchins as extensively as do sea otters, even though sea urchins often are common where marine otters live. Unlike sea otters, marine otters shelter in rock cavities for daytime rest and parturition. Nearly all species of otters face increasing threat as urbanization and logging continue. North American river otters (L. canadensis) are still taken as part of the commercial fur trade, but the primary threats to others are the destruction of wetland habitats and pollution. Heavy metals and contaminants such as mercury and PCBs accumulate in otter tissues and in time impair both reproduction and survival. Pollution also affects fish populations on which otters often depend. Conservation of remaining wetlands and restoration of water quality are currently the most important steps toward ensuring the future of otters. 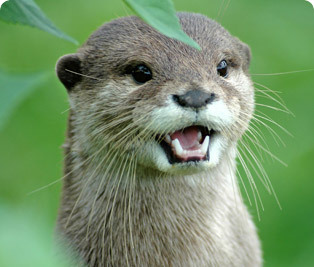 Most authorities maintain that 13 species of otters make up the subfamily Lutrinae. The status of the Congo clawless otter remains a subject of debate, however, with most researchers considering the animal to be a subspecies of the African small-clawed otter (Aonyx capensis) and giving it the taxonomic name A. capensis congicus. Others claim that the Congo clawless otter is a valid species and have given it the taxonomic name A. congicus. Sea otter, (Enhydra lutris), also called great sea otter, rare, completely marine otter of the northern Pacific, usually found in kelp beds. Floating on its back, it opens mollusks by smashing them on a stone balanced on its chest. The large hind feet are broad and flipperlike. It is 40–65 inches (100–160 cm) long and weighs 35–90 pounds (16–40 kg). The thick lustrous coat is reddish to dark brown. By 1910 it had been hunted almost to extinction for its fur; now fully protected, it is gradually increasing in numbers. The solution #7388 is correct. Neat work, Monox D. I-Fly! The solution #4446 is correct. Neat work, Monox D. I-Fly! #4447. The average of 5 positive integers is 436. The average of the first two numbers is 344 and the average of the last two numbers is 554. What is the third number?